ePosters - Compliance with the BTS guidelines for follow-up of indeterminate pulmonary nodule on CT.
Poster Title: Compliance with the BTS guidelines for follow-up of indeterminate pulmonary nodule on CT. 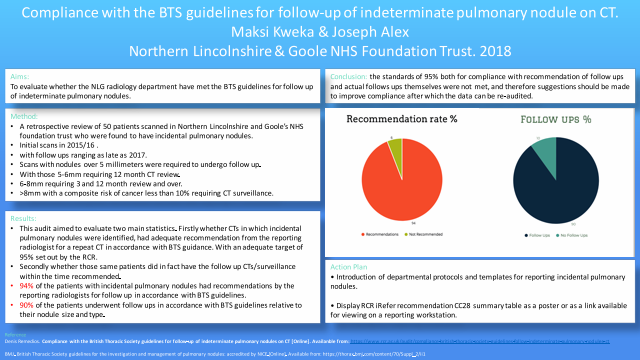 Method: A retrospective review of 50 patients scanned in Northern Lincolnshire and Goole’s NHS foundation trust who were found to have incidental pulmonary nodules. Scans with nodules over 5 millimeters were required to undergo follow up. With those 5-6mm requiring 12 month CT review. 6-8mm requiring 3 and 12 month review and over 8mm with a composite risk of cancer less than 10% requiring CT surveillance. Results: This audit aimed to evaluate two main statistics. Firstly whether CTs in which incidental pulmonary nodules were identified during the period of 2015/16 with follow ups ranging as late as 2017 had adequate recommendation from the reporting radiologist for a repeat CT in accordance with BTS guidance, with an adequate target of 95% set out by the RCR. Secondly whether those same patients did in fact have the follow up CTs/surveillance within the time recommended. 94% of the patients with incidental pulmonary nodules had recommendations by the reporting radiologists for follow up in accordance with BTS guidelines. 90% of the patients underwent follow ups in accordance with BTS guidelines relative to their nodule size and type. Conclusion: the standards of 95% both for compliance with both recommendation of follow ups and actual follows ups themselves were not met, and therefore suggestions should be made to improve compliance after which the data can be re-audited.